With Camber lenses, the innovative lens blank is only the beginning. When the unique front surface is combined with a sophisticated back-side digital design, both surfaces work together to become the Camber finished lens. The following is an introduction to the three synergistic components of a Camber finished lens. The Camber finished lens is made up of three synergistic components: The Camber blank, the Rx Design computation, and the individual wearer’s custom parameters. 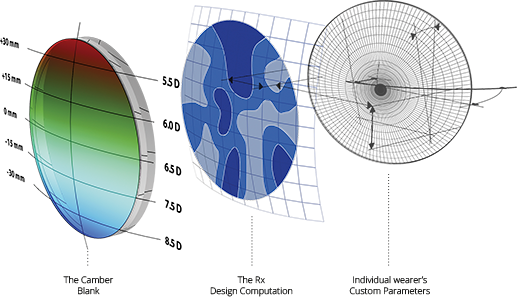 The unique curvature of the Camber blank, plus any desired Individualization Parameters, are used by the Rx Design Computation to optimize the digitally surfaced design for enhanced lens performance. The Camber lens blank improves on the single vision lens blank, by offering a continuously increasing base curve that is better suited for progressive prescriptions. The state-of-the-art, digitally designed back surface of the lens is calculated in mutual accord with the unique Camber variable base curve. The Camber Rx design computation was developed by IOT, an international digital design firm that has been steadily gaining recognition in the industry. The Rx Design Computation is further enhanced, when desired, by a complete set of individualization parameters that take into consideration the unique attributes of the frame and preferences of the wearer. The result is a finished lens that is comprehensively customized for each individual patient. The combination of the Camber variable base curve front surface and the enhanced digital back surface design creates the Camber finished lens, an advanced digital progressive lens that provides remarkable visual acuity in every viewing zone. Camber finished lenses give wearers an outstanding visual experience, with spacious reading zones, improved peripheral vision, an expanded Rx range, better-looking lenses in many prescriptions, and user-preferred near vision performance.